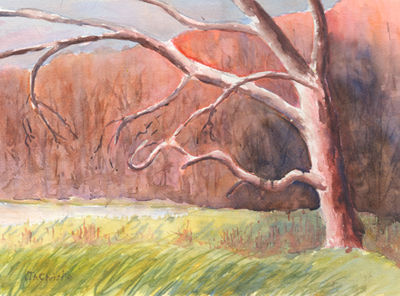 Four of us met at the RBG and I made another attempt to paint the old sycamore tree down by the marsh. It was a very damp and drab day but the sections of the sycamore where the bark is peeled off glowed as usual. I have some problems with this version but it is much better than the first try. I may try to soften the hard edges at the top of the treeline and at the top of the grass behind the tree. They don't look quite so sharp in real life so I may just leave them. I couldn't shake the impression of the Group of Seven show at the Mcmichael Gallery so I enrolled in a beginners oil painting class at the Dundas Valley School of art. Maybe a change will be as good as a rest. John and I met at the RBG again today. When we got there it was just above freezing but the sun was warm and by the time we hiked down to the shore and found good painting spots we were toasty warm. By the time we left it was up to 8 degrees C and very warm in the sun. The sun was causing this willow and the reeds to just glow but I lost it. I need to rethink my palette. 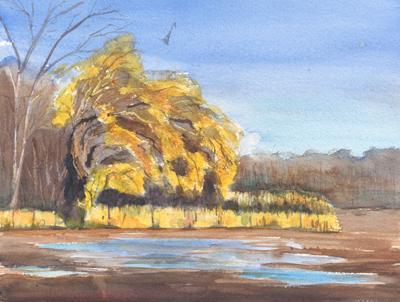 Burnt Sienna and Cobalt blue make wonderful mud colour but are too muddy for the background. This is another painting that I am not overjoyed with but there are some parts that I like and it was another glorious day to be outside painting. The bay were the willow is was all mud with a few puddles but straight out from shore there was water with a thin crust of ice on it. Two paddlers in two canoes were taking advantage of the low water levels to attempt to herd some Koi to chase them out of Coote's Paradise. They had to break through the ice for about 50 feet to get to open water. 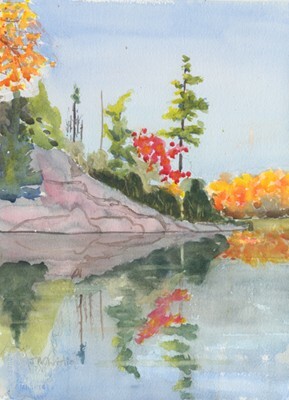 I painted this same scene en plein air in the summer while at A Brush with the Highlands in Wilberforce Ontario. I took a photo of the same scene in the fall while we were staying at my parents home on Paudash Lake and I painted this from that photo. I am not sure whether I am happy with the painting or not but Debbie likes it so I will hold off judgement for a while. It is an 11" X 15" watercolour. Debbie and I went to the McMichael Gallery to see the "Painting Canada: Tom Thomson and the Group of Seven" exhibition. The gallery has a fantastic Group of Seven collection however this show was put together with paintings from their collection, the National Gallery, the Art Gallery of Ontario and some private collections never before shown in public. It was shown in Britain and Europe and this is the only Canadian showing. 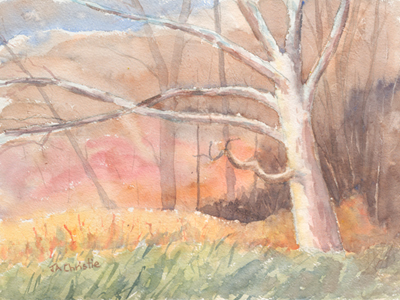 In many cases the plein air sketch was hanging beside the studio painting. It was brilliant and very worth the trip. I am very tempted to take up oils. I met with John at the RBG again today. It was about 2C so I could still use watercolour. My fingers were getting really cold after a couple of hours but at least my paint didn't freeze. There were beautiful billowing grey snow clouds but I elected to ignore them and paint one of the glorious sycamores that I have had my eye on. I didn't go dark enough and overworked it a bit but I am okay with it. I will probably paint this scene again only starting off with more pigment and darker. We are coming back here on Friday so maybe then.